“U.S. Figure Skating announced today the ice dance teams who will compete at the Olympic Winter Games PyeongChang 2018 as part of the U.S. Olympic Figure Skating Team. 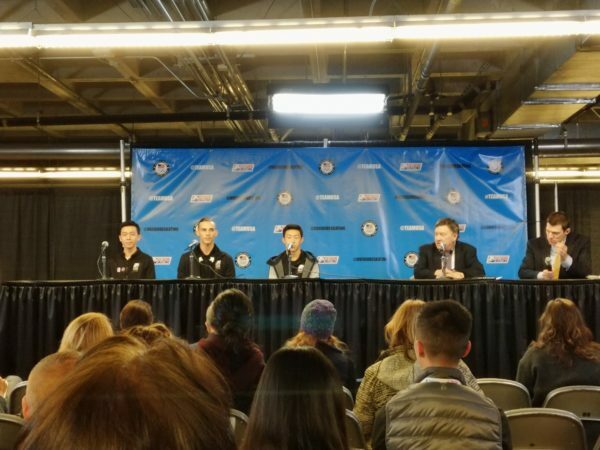 The ice dance team is Madison Chock and Evan Bates, Madison Hubbell and Zachary Donohue, and Maia Shibutani and Alex Shibutani. Madison Chock and Evan Bates are the 2018 U.S. bronze medalists. They are the 2015 U.S. champions, 2016 World bronze medalists and placed eighth at the 2014 Olympic Winter Games in Sochi, Russia. After winning silver at both of their Grand Prix assignments this season, they qualified for their fourth-straight Grand Prix Final. Earlier that day, I got to see Maia & Alex Shibutani perform, and they were favored to win the Gold for the 2018 U.S. Championships (often referred to as “Nationals”) for Ice Dance, but had a minor hiccup in their free dance routine which cost them dearly, when Madison Hubbell and Zachary Donohue performed flawlessly, wining in total points (short dance + free dance) 197.12 vs. the Shibutani’s 196.93, a difference of just .19 points! Maia & Alex Shibutani were amazing. I remember seeing others post about them on Facebook, and you should take a look at yourself at how talented they are. This will be their *second* trip to the Olympics, as they competed also in 2014. Amazing. Additionally, Asian American Madison Chock and her ice dancing partner Evan Bates made the team as well, and I also had the opportunity to see them perform for the free skate routine. From Wikipedia, Chock’s background is: “She is of Chinese-Hawaiian descent on her father’s side, and German, English, Irish, French, and Dutch descent on her mother Barbara Hall’s side.” Chock doesn’t sound like a Chinese last name to me, but perhaps it was anglicized non-traditionally. Congratulations to all who made the Olympic team! She’s not the only one who’s confused. Her numerous supporters, along with many journalists, longtime figure skating observers, and figure skating fans, have also been shaking their heads, trying to make sense of it all. Of course, no one, least of all Mirai, is confused about how U.S. Figure Skating officials justified their decision to leave her off both the Olympic and World Championship teams. Her third-place finish at Nationals was never, according to U.S. Figure Skating’s rules, going to guarantee her a place on them. The decision was based on a comparison of each skater’s 2013-14 “body of work,” meaning each skater’s results in certain major competitions during that time period. So on this, no one is confused; U.S. Figure Skating officials were operating within their rights when they left Mirai off those teams. The skating federation’s powerful International Committee Management Subcommittee (ICMS), the nine-member group that actually makes the selections, did indeed follow their rules, based on the letter of their law.